Rhydian's life and career to date! 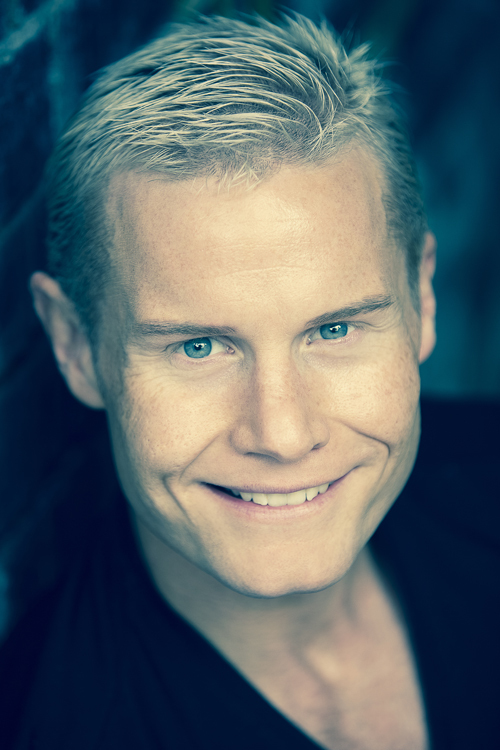 Rhydian Roberts is a classically trained baritone who has become one of the UK’s most successful classical crossover artists. A double platinum selling recording artist, who was nominated for a Classical Brit award and has had several sell-out solo tours, he has also appeared in acclaimed touring musical theatre productions including ‘We Will Rock You’ and ‘Jesus Christ Superstar’ and has duetted with some of the world’s great singers including Bryn Terfel, Dame Kiri Te Kanawa and Idina Menzel. Rhydian was born in Brecon, Powys, Wales, on 14th February 1983 and attended the Pontsenni Cylch Meithrin, followed by Ysgol Bannau Welsh medium school in Brecon. From the age of 5 he represented both his school and Powys, as a boy soprano, in the Urdd Gobaith Cymru Eisteddfod. He maintained his links with the Urdd whilst at Llandovery College, where he became Head Boy. After school, during a gap year, he taught in a small school in South Africa and then won a place at Birmingham City University where he joined the Conservatoire, graduating in 2007 with a first class honours degree in Music. In his second year at University, Rhydian was auditioned by the City of Birmingham Symphony Orchestra's (CBSO) Musical Director, Sakari Oramo. He played Morales in the CBSO's semi-staged Carmen and secured leading roles in virtually all of the Conservatoire's operas and musicals. Amongst the roles he played were Charley in Merrily We Roll Along by Stephen Sondheim (Crescent Theatre, Birmingham), and the title role in Dr Jekyll and Mr Hyde. Playing Edward Kelley in Doctor Dee, he was noted by the Birmingham Post as charismatic, threatening and attractive. His Morales in Carmen was praised for conveying genuine depth of masculine charisma and in Rossini's L'Italiana in Algeri his commanding stage presence was again singled out. As a student he won the Cecil Drew Oratorio Prize, the Mario Lanza Prize and the Reginald Vincent English Song Prize and is very proud to be a Kathleen Ferrier award winner. During his final year at University, in 2007, and having already gaining a place at the Royal Academy of Music in London for his Post Graduate course in Musical Theatre, Rhydian auditioned for The X Factor. He was openly self-assured and ambitious and Simon Cowell originally said “He stands out because he has an incredible voice”. His performances on the X Factor were the highlight of the series and included Pink's ‘Get This Party Started’ and a full theatrical account of ‘The Phantom of the Opera’, which led to Celine Dion saying “Rhydian is in a different league, he’s amazing”. Whilst favourite to win the series he controversially finished as runner up but was still offered a recording contract by Simon Cowell and spent much of 2008 working on his debut album. November 2008 saw the release of his eponymous album 'Rhydian' which gained platinum status in weeks and earned him the title of highest selling male solo artist of the year. Rhydian entertained an audience of over 30,000 with his rendition of "Music of the Night" at Andrew Lloyd Webber's 60th Birthday Party in Hyde Park and, having heard Rhydian sing, HRH Prince Charles invited him to become a patron of The Prince's Trust. In 2009, with more than 600,000 albums sold, he embarked on a 27 date sold-out UK Tour and in November he released his second album, ‘O Fortuna’, produced by the world renowned composer Karl Jenkins, which reached gold status and earned him a Classical Brit nomination. He also recorded his own television special for Welsh broadcaster S4C which aired over the Easter period, followed by the documentary 'Rhydian, One Year On'. In April 2009, Rhydian again entertained the Royal Family, at "The Prince's Trust Celebrates Success" Awards and later headlined one of the Liverpool Pops concerts in the Echo Arena where he performed for 11,000 fans. Rhydian's engagements in 2010 included several all-star gala evenings, three of them at London's Royal Albert Hall. With ‘O Fortuna’ nominated for Album of the Year, his third appearance there was at the Classical Brits Awards, televised by ITV. Rhydian also starred in the musical adaptation, by Jeff Wayne, of ‘The War of the Worlds’, which completed a major arena tour in Nov/Dec 2010. Rhydian played the intense role of Parson Nathaniel, alongside former Atomic Kitten Liz McClarnon, West End and TV star, Jason Donovan and the incredible Justin Hayward of the Moody Blues. In 2011 he joined the cast of the West End musical 'We Will Rock You', the worldwide smash hit show by Queen and Ben Elton, taking on the role of super villain ‘Khashoggi’, the Chief of the Secret Police. July 2011 saw the release of his third studio album 'Waves', a departure from classical crossover into the world of synth pop/new wave, which was later heralded, by The Independent, as one of the top ten cover albums of all time. Rhydian also starred in a nine-episode series of his own light entertainment show on Welsh television channel S4C.His star guests included many household names; Hayley Westenra, Aled Jones, Ruthie Henshall, Spelbound to name but a few. His fourth studio album 'Welsh Songs' was released, in December 2011, off the back of the series. 2013 saw Rhydian complete a second sold out solo tour and continue his run as Rocky in famous musical ‘The Rocky Horror Show’. 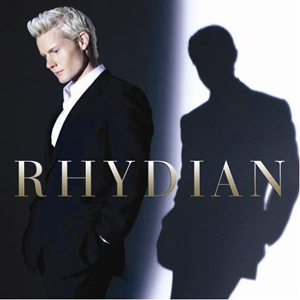 On 14th April 2014, Rhydian released his fifth album ‘One Day Like This’, which stormed to No 1 in the Official Classical Charts, and gained a top 20 position in the Official Music Charts. After 10 consecutive weeks at No1, the album went on to become one of the highest selling classical albums of the year. The album, which saw Rhydian return to his first love, classical crossover music, includes some deeply personal choices including The Pearl Fishers duet by Bizet. It was this song which inspired Rhydian to become a singer at the age of 14 and on the album he was thrilled to be able to duet on the track with himself, as both baritone and tenor. 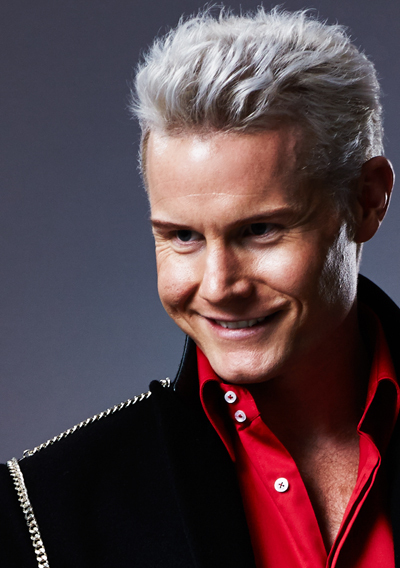 The album is definitive proof of Rhydian’s position as a world class singer of classical crossover repertoire. In the autumn of 2014, Rhydian completed his third solo tour across major UK cities, showcasing his latest album, and ended the year by landing the role of the Beast in 'Beauty & the Beast' at the Theatre Royal, Windsor. He starred alongside Sheila Ferguson of the Three Degrees and TV legend Basil Brush! 2015 began with Rhydian starring as Pontius Pilate in the touring musical, Jesus Christ Superstar, where he earned rave reviews. His sixth studio album ‘Carry the Fire’ was inspired by his love of rugby and the approaching Rugby World Cup, played in England and Wales in 2015. It features much loved rugby anthems from all of the Home Nations plus two rousing original songs, co-written by Rhydian, ‘Come On Ye Faithful’ and ‘Take Me Home’. In December 2015 Rhydian starred as Prince Charming in the Rhyl Pavilion pantomime ‘Cinderella’ and then took on the role of the sadistic dentist, Orin Scrivello, in the touring production of Little Shop of Horrors. 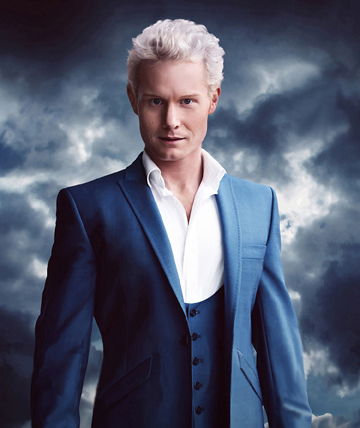 The show was a great success and Rhydian's portrayal was very well received by press and audiences alike. Christmas 2016 saw him reprise his role as Prince Charming, this time at Bournemouth Pavilion. Rhydian released his seventh studio album 'The Long Road' in 2017, followed by a live tour in the autumn alongside classical brothers Richard & Adam. Christmas 2017 saw Rhydian starring as the evil magician Abanazer in the pantomime 'Aladdin' at the SSE Arena in Belfast. In the summer of 2018 Rhydian starred alongside Jonathan Ansell (G4) in an extremely successful 'Les Musicals' tour - two of the finest classical voices joined forces in a unique interpretation of the best loved songs from musical theatre. His album ‘The Long Road’ was re-mastered and re-released in 2018, and included a new duet with Jonathan. This Christmas Rhydian will be in Chesterfield starring as Prince Charming and hoping to capture the heart of yet another Cinderella.